The world-famous Aurora Sky Station located in Abisko National Park Sweden is undoubtedly one of the best places in the world to see the Northern Lights! As you are lifted into the night sky aboard the open air chairlift, marvel at the stars and be ready to be amazed as the Northern Lights dance above your head. At the top you will find a small restaurant and observation tower, all designed with minimal lighting to ensure your view of the night sky is not spoilt high up on the slope of Mt Nuolja. Take the chairlift into the night sky for an evening at the Aurora Sky Station. With expert guides at hand you will have all your questions on the Aurora answered. Spend some time in the viewing tower, in the Aurora exhibition or at the comfortable small cafe before heading back out to search for the Northern Lights in all of their glory. 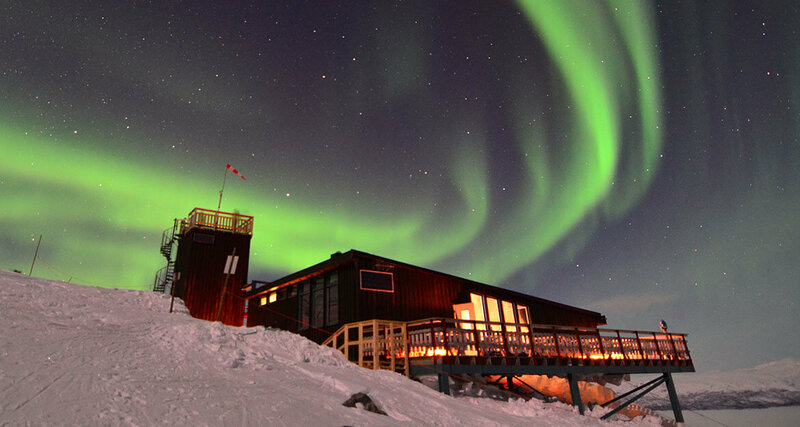 Upgrade your night visit and enjoy a gourmet four-course dinner at the world-famous Aurora Sky Station. This luxurious addition includes arriving at the Station several hours before the other guests to enjoy a delicious meal prepared by one of the Sky Station’s professional chefs. This once-in-a-lifetime dining experience is sure to be a highlight of your trip!